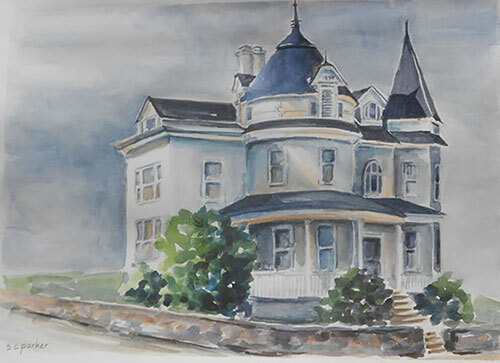 Local artists Kat Cimaglio and Susan Parker will team up for and exhibit of paintings called “Town and Country” in the Back Space Gallery in the Berkeley Art works. The exhibit opens June 26 and runs through July 20 in the gallery at 116 North Queen Street in Martinsburg. Life on Kat Cimaglio’s farm is shaped by the seasons and the animals. Both present challenges and rewards, joy and sadness – sometimes a little income. No day is ever quite the same as the one before. But for Kat, as a painter, it is impossible to resist capturing some of this on canvas. 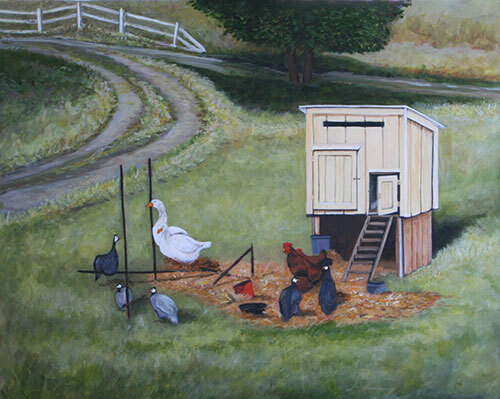 What is seen in her paintings are the things that surround her every day and are part of the fabric of rural life. Martiinsburg grew significantly during the late 19th century, which was the Victorian era, and the period of the Industrial Revolution. As an important railroad center, and with the development of the local textile factories and the orchard industry, the town prospered. As the population grew, many classic, Victorian-style homes were built. These houses ranged from modest middle class dwellings to the large, elegant homes of the wealthy. Most of these interesting houses are still standing, some beautifully restored, others in need of attention. All have the characteristic and often ornate style typical of the period. These watercolor sketches attempt to capture the essence of some of these architectural gems. Also opening at the same time as the “Town and Country” exhibit is the “Summer Fire” Ceramics and Pottery exhibit in the main gallery at the Berkeley Art Works. A reception for both exhibits will be Saturday, June 28 from 5-7pm.